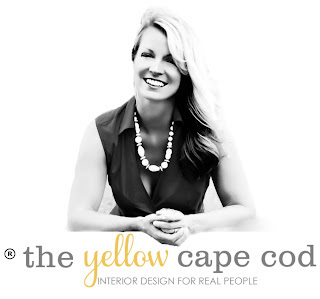 Welcome to The Yellow Cape Cod 2015 Christmas home tour! 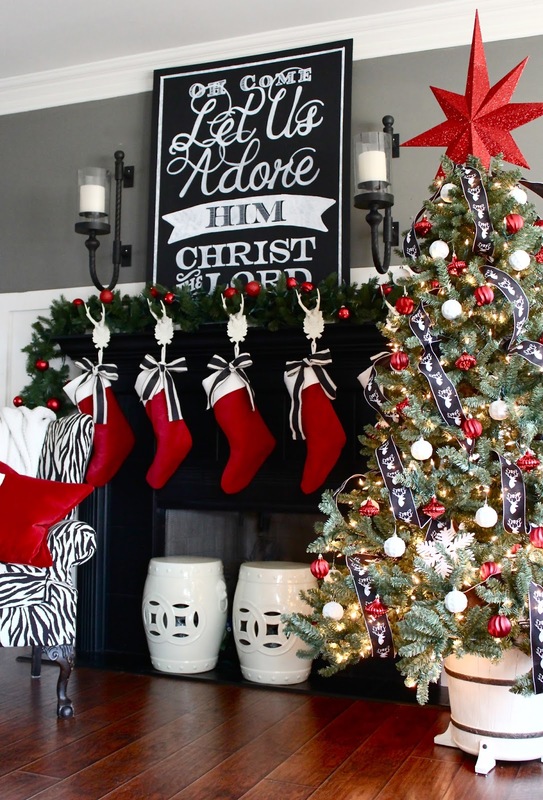 My home is number 21 on The Holiday Housewalk, an inspiring, week-long, online tour of Christmas homes presented by Jennifer Rizzo. I'm excited to announce that we are partnering with Joss and Main and Good Housekeeping! At the end of this post, you will find direct links to items I used in my holiday home this year that are available at Joss and Main. 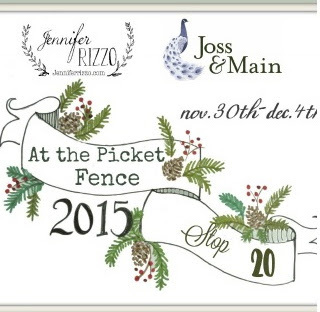 If you are visiting from At The Picket Fence, thank you for stopping by and continuing the tour with me! Wasn't that tour absolutely beautiful?! It's a hard act to follow. If you did not stop by as part of the tour, please be sure to hop on here and then go back to the beginning to see some absolutely beautiful homes, all dressed for the holidays from all parts of the country. This is the third year I've participated in the housewalk. If this is your first time here, let me introduce myself. My name is Sarah Macklem, I'm a professional Home Stylist from Detroit, Michigan. This blog is where I share my daily design adventures along with DIY tutorials, entertaining ideas, exciting room makeovers and more. 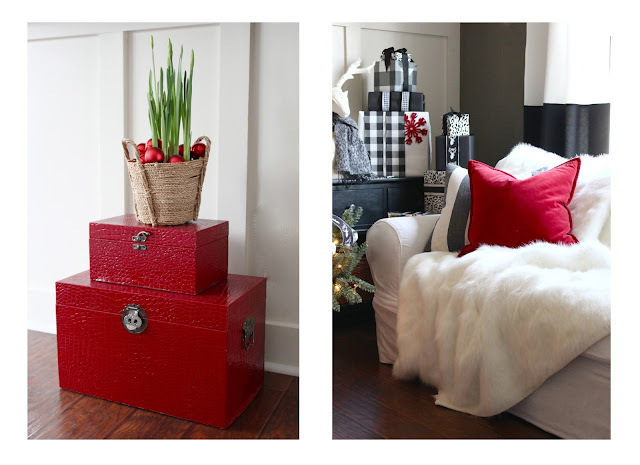 I operate my busy online interior design studio and often share my professional design work here on the blog. In addition to being the title of this blog, "The Yellow Cape Cod" is my home where I live with my husband, our three children and Murphie the dog (who, by the way, is totally smitten with his new dog bed from Joss and Main). Let's start the tour in the room where my family will start Christmas morning, the breakfast nook. A big, leisurely, Christmas morning breakfast is a tradition in our house. 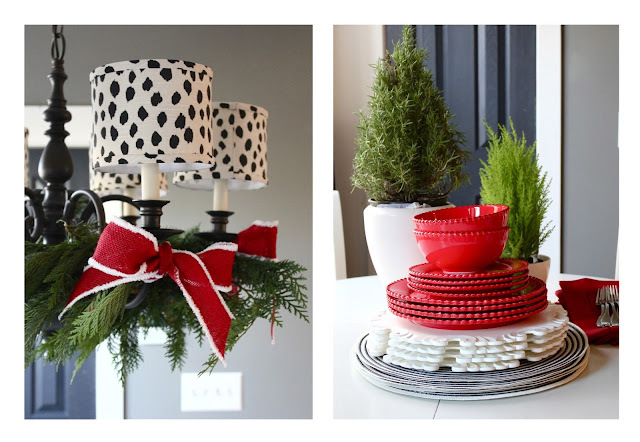 This year, I gave our chandelier a little Christmas makeover with new spotted chandelier shades, fresh greenery and red ribbon. (A step by step tutorial on how I decorated this chandelier can be found here). 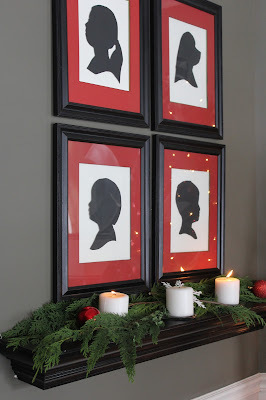 (A full step by step tutorial on this DIY Art Project can be found here). I made this art by using white paint markers on a sheet of MDF painted in flat black latex paint. It started with a free printable I found here. 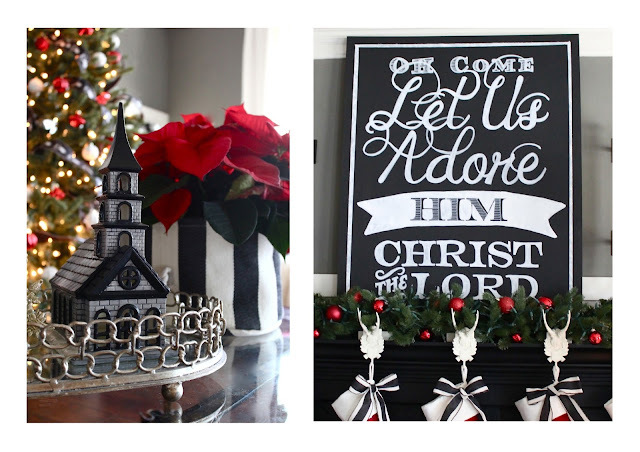 In my tutorial, I share exactly how I made this extra-large Christmas art for less than $25! Not only did I love the budget for this large scale project, but it has special meaning to us. It's one of our favorite Christmas carols. We sing it every year at Christmas Eve church service. The family room is where all the holiday naps take place. This year, I gave our holiday napping spot next to the tree an upgrade with an extra large, extra soft fur blanket. Within a few hours of opening the new fur blanket, I caught a precious little napper taking full advantage of the new cuddle spot. He gave it a five star review. 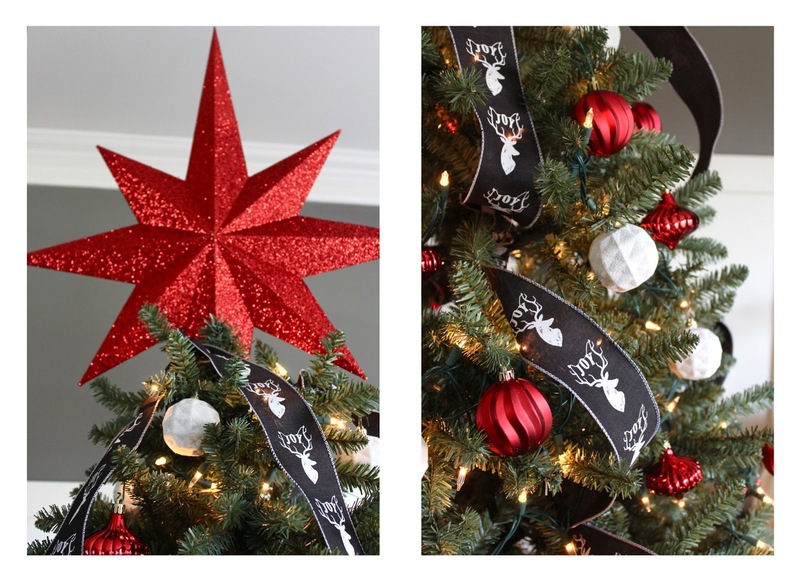 Our tree in the family room is decorated in shiny red and glittery white ornaments from Joss and Main along with a fun deer ribbon I found at the craft store. We have a family tradition to add the kids Christmas ornament collection on the tree together, as a family when it gets closer to the big day. That had not taken place yet when I took these pictures for the housewalk. I was sure to leave plenty of room on the tree for the kids to place their ornaments on the family tree when the time comes, yet until then, it looks bright and festive. 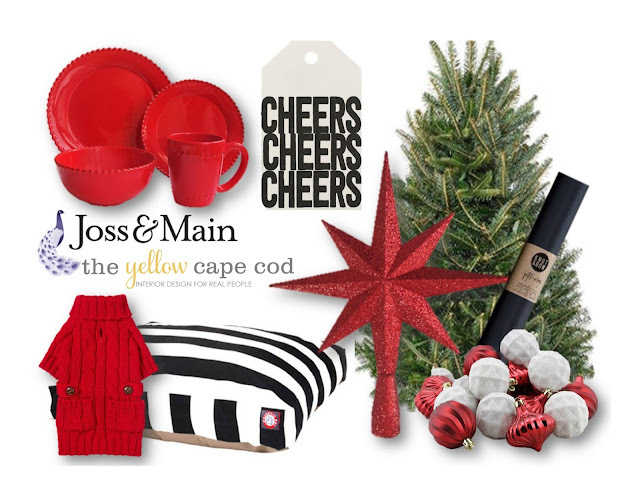 Especially with the dramatic, large scale, glittered red star tree topper from Joss and Main. This tree topper is a big time conversation starter. It's simple, but stunning, thanks to it's extra large scale, bright color and intense sparkle factor. 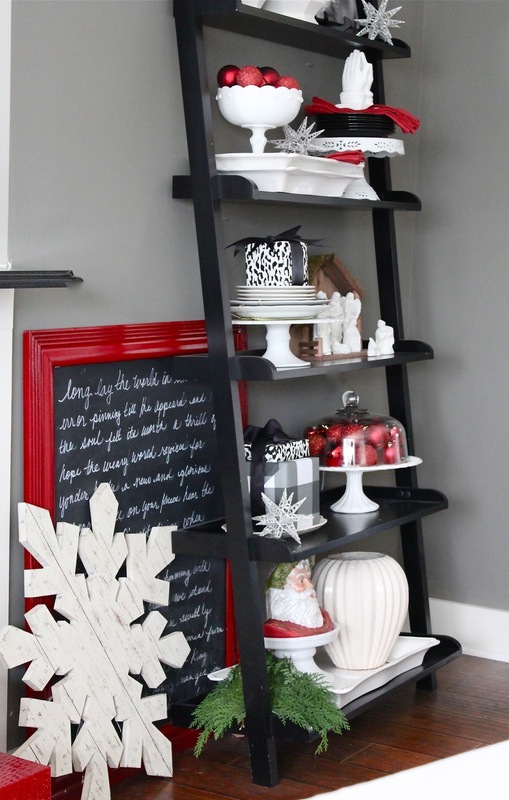 In the corner of our family room is a ladder shelf that I use as a butlers pantry of sorts during holiday parties. 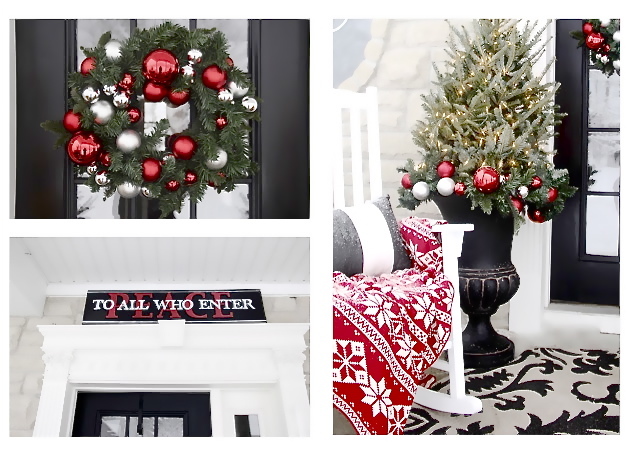 This year, I created one of my favorite Christmas vignettes in this spot, totally on accident. Here is how it happened, we were preparing for our first holiday dinner party the day after Thanksgiving. I was busy cooking, cleaning and decorating for our housewalk photos all at the same time. 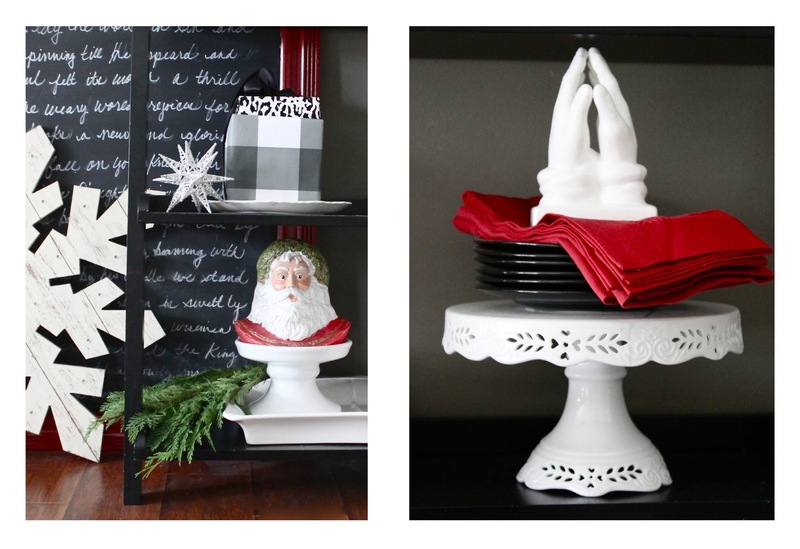 I stuck a bunch of extra Christmas decor in this corner in a big hurry just to get it out of the way of our guests. I also stacked up some of our entertaining supplies for the evening here and then realized, I loved the way it all looked together. The "painting", we'll call it, was a thrift store mirror that I sprayed cherry red, painted the glass with chalkboard paint and then hand wrote the lyrics to another one of our favorite Christmas carols. The Nativity set is one of our favorite Christmas decorations and takes center stage wherever it ends up. Our party that day was a big success and was a good reminder to slow down and enjoy every minute of the season. Even the smallest moments, like accidentally creating a favorite Christmas vignette, are special. My family enjoyed the decorations, the food and each others company that day which made all of the work leading up to it beyond worth it. 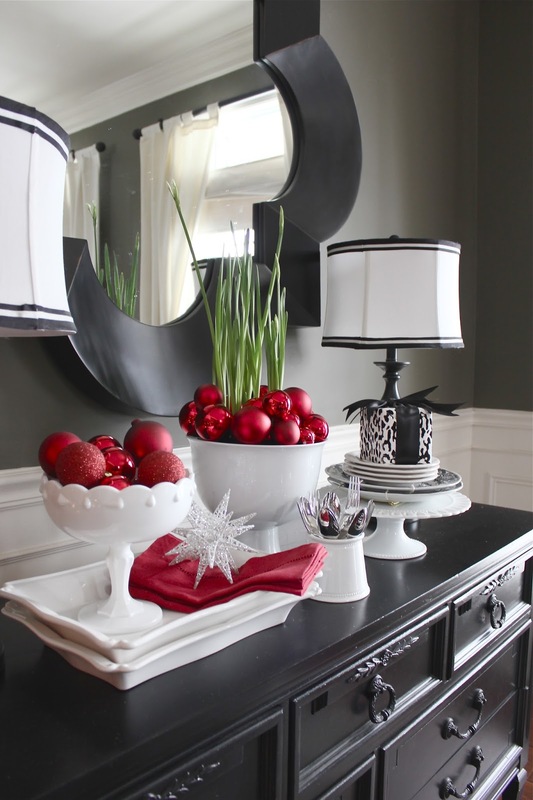 Most of our time entertaining during the holidays is spent in the formal dining room. We come from a long line of eaters. We love to eat all the time, but especially during the holidays. So, this year, I decked the dining room out with a full Christmas tree, lots of greenery, fresh plants, and a ton of Christmas bling. 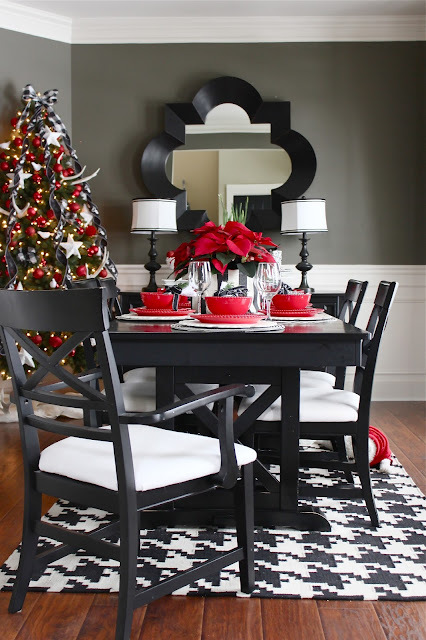 Our new Christmas dinnerware from Joss and Main brightens up the entire dining space and sets a festive mood. For place cards, I tied gift tags from Joss and Main to napkin-wrapped silverware and stuck a sprig of fresh cedar in each one. The bold graphic pop of the Three Cheers typography lends a fun, youthful look to the otherwise traditional table setting. Another graphic element in the dining room is Murphies' new dog bed under the Christmas tree. Murphie loves to hang out in the dining room because it is the sunniest room in the house. 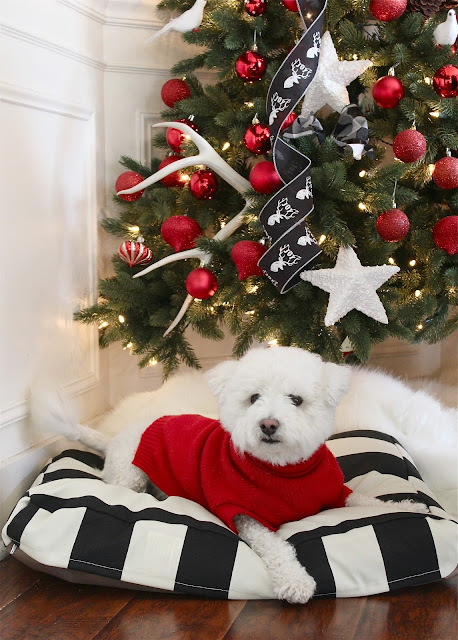 A sunny spot, under the Christmas tree, on a comfy new bed…doesn't get much better than that for our little Murphie. Speaking of the Christmas tree, the dining room tree this year is dedicated to natural elements, such as the naturally shed deer antlers my neighbor collects and gives to me to decorate with. I placed them in the tree along with pine cones, birds and other nature-inspired ornaments. 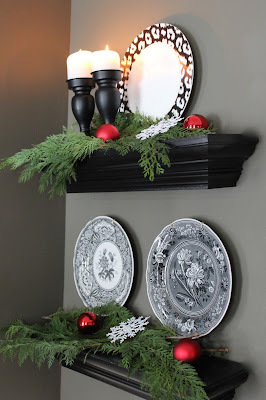 Fresh cedar and red balls placed on the crown molding ledges my husband made for me several years ago for my birthday give the room instant Christmas cheer and draw attention to my special shelves. By the way, in my opinion, you can never have enough red Christmas balls. After forcing my Narcissus bulbs, I put them in thrift store bowls and topped them left over red ball ornaments to create a cheerful Christmas centerpiece on our serving buffet. 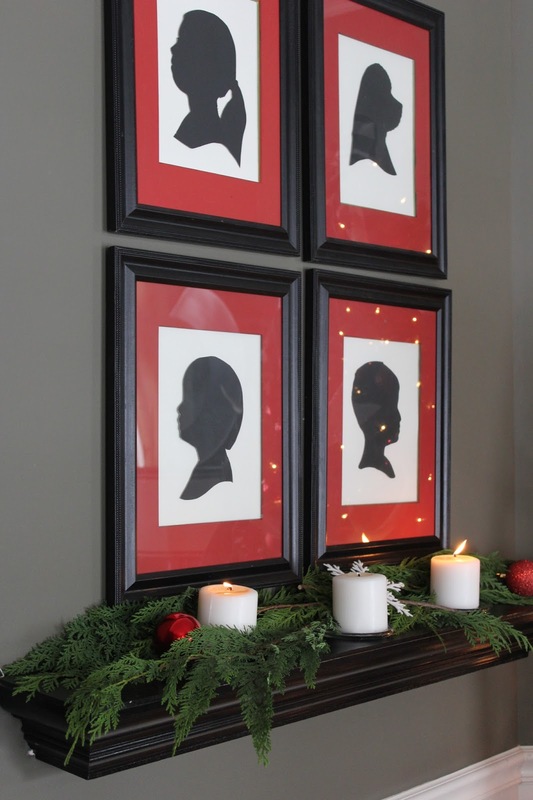 I hung the kids silhouettes in the dining room this year for a bright pop of color and a little nod towards Christmas past. I look at these and still can't believe they were so little. 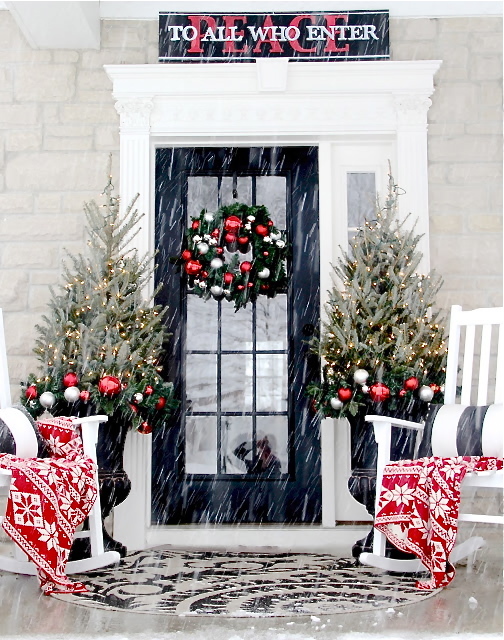 The last stop on our holiday home tour is our front porch. This year, I had everything ready well in advance to decorate the front porch and shoot the housewalk photos on the first snowfall. Funny, that no matter how much planning I do, I forget that I am not really in charge at all. Mother Nature swooped in with a snowfall the day of the shoot allright, but it was a crazy, windy, 11 inch snow storm that hit like a Mack truck leaving me with wind-blown photos, unfocused from thick snowfall and a wet camera lense. Luckily, this blog is all about "Design For Real People" and I can share my crazy, snow-storm porch photos and not worry about them looking less than perfect. 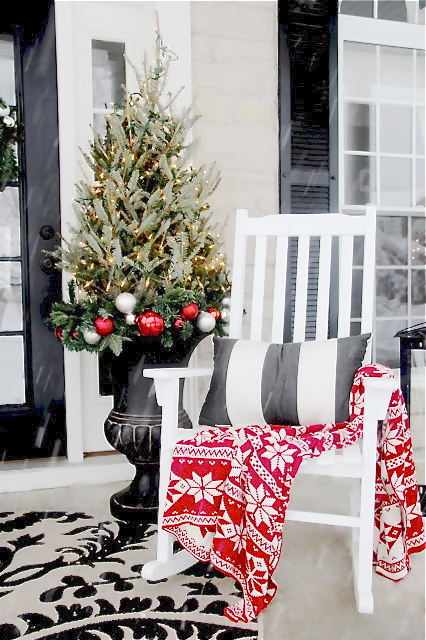 To welcome our guests, I cozied up our porch rockers with snowflake throw blankets. 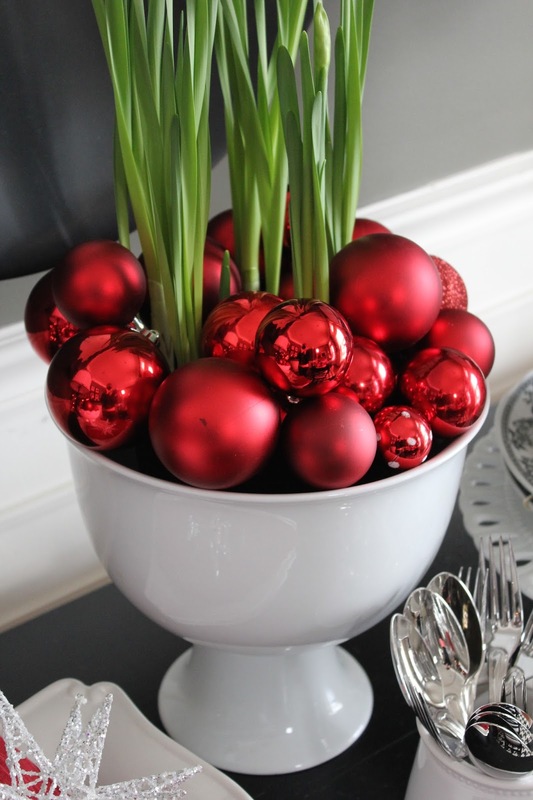 I flanked the door with a pair of real, fresh, fraser fir, 3 foot Christmas trees planted in my urns and decorated with a simple red and silver ball garland around the base. The round porch rug is an indoor-outdoor carpet that works great in all climates as an upgrade to the traditional "door mat". It gives the front porch the same feeling of importance as the indoors while still being a practical, outdoor friendly design element. I painted the sign, "Peace To All Who Enter" with paint markers on leftover MDF from my mantle art project, making this an absolutely free piece of art. To conclude our 2015 Holiday Housewalk Home Tour, I'd like to share one of our families favorite Christmas traditions, paper lanterns. By simply placing tea light candles in sand-filled, white bags and placing them in a row to your front porch, you are almost always guaranteed two things. First, that Santa is sure to find your home. And second, that your neighbors will inquisitively stop by for a visit (as they did on this night). Thank you for stopping by and taking our 2015 Holiday Home Tour. The next home on the tour is one of my personal fav's. 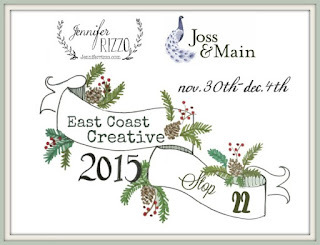 Click here to see what East Coast Creative has been up to this year! May you enjoy your home and family time during this special season. Don't forget to go to East Coast Creative and finish the tour. For more inspiration, please follow our Pinterest Board with Good Housekeeping (here). Your home NEVER disappoints! So bold & festive and everything flows so smoothly, love it ALL! Hi Paige! Thank you so much! I hope you and your family have a wonderful holiday this year! Gorgeous, Sarah! 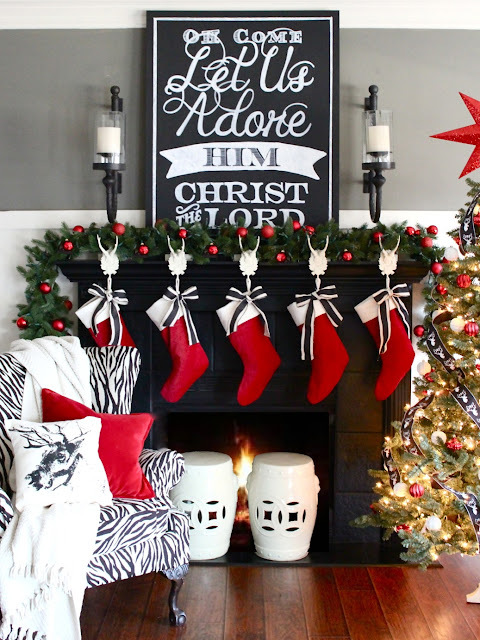 I love your color scheme ... your mantel and tree look fabulous (I have that same awesome reindeer "Joy" ribbon on our tree) ... and, your front porch is beyond welcoming! Happy Holidays! Hi Becca! Thank you! That ribbon was such a fun find at the craft store and couldnt beat the price! Happy Holidays to you and your family! Beautiful! I love the snowy photos - makes it even more festive! 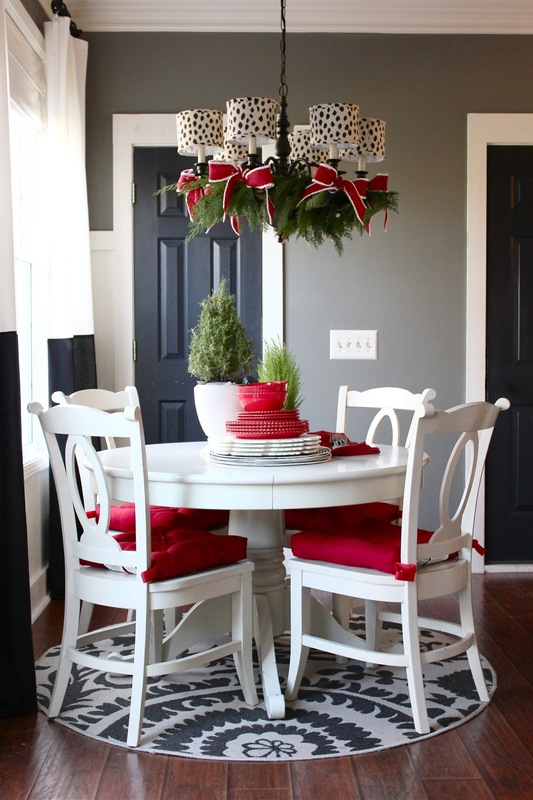 :-) Adorable spotted chandelier shades too - everything is just gorgeous! Hi Jenny! Thank you so much! Happy Holidays!! So beautiful!!! Where can I find those gorgeous deer stocking hangers?? Thank you Ashley! The stocking holders are from Ballard Designs. Merry Christmas! 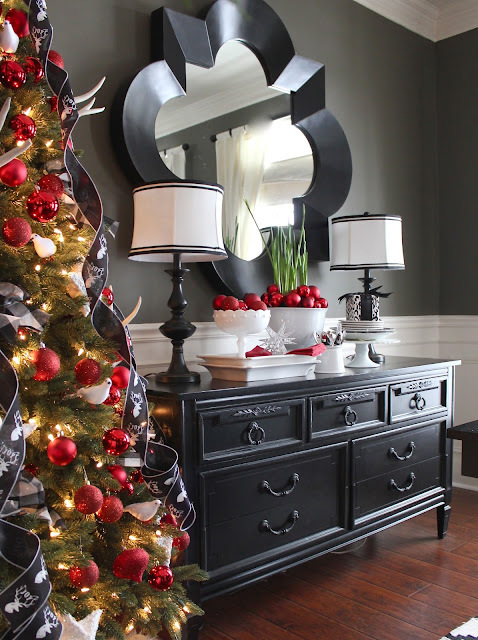 Very stylish and festive! 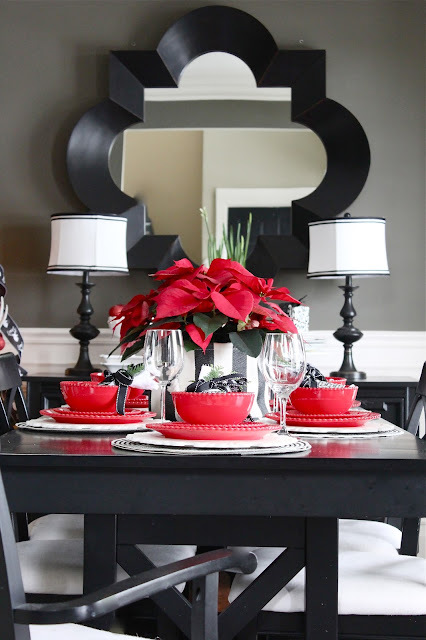 Love all the black and white with the pops of red. Merry Christmas!! those lanterns are so pretty! and i love your black, white, and red scheme- gorgeous! and i may have a couple antlers appear in a tree i am sharing next week! great minds! Hi Cassie, thank you so much! 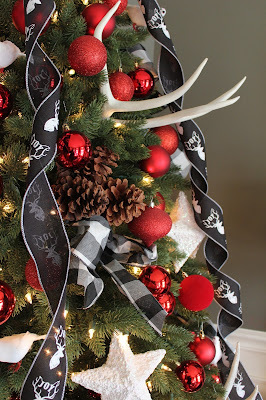 I cant wait to see your antler tree!! Happy Holidays! Thank you so much for sharing your lovely home as a part of the tour!!! My pleasure Jen! Thank YOU for having me! This year has been amazing! Merry Christmas. So ahhhhmazingly beautiful Sarah! I just ooo'd and ahhhh'd over everything! 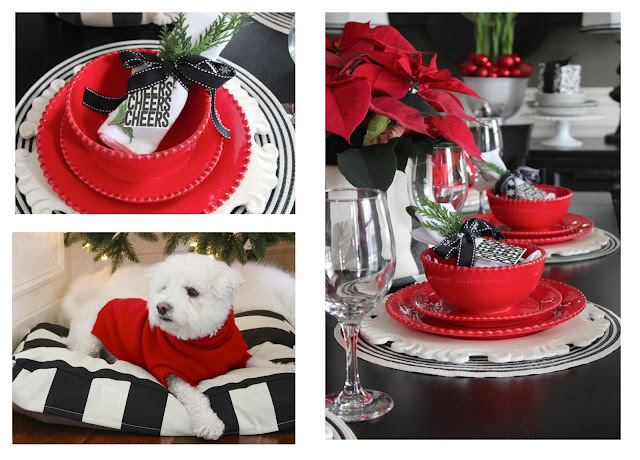 We are kindred spirits when it comes to red, black and white at Christmas time! (and I think our interior doors are painted a similar color!) Thanks so much for sharing with us! Wow, that is such a humbling compliment. Thank you. Always happy to meet another red lover! Merry Christmas!!! I love what you've done, I especially love the light fixture over the round dining table and your front entry...Fabulous! Thanks for sharing! Hi Loris, thank you so much! Cheers back to you! Sarah everything is absolutely stunning!!! The very definition of festive. :-) The lanterns lining the walkway to the front porch just make it all look so warm and welcoming and every detail is impeccable. Such an honor sharing a tour day with you! Thank you! That means a lot to me coming from you! It has been a fun tour, I LOVE yours every year but especially this year! Happy Holidays! I really love the color scheme you have going on. Those bold punches of red against all the black and white is so stunning! Well done! Thank you! So happy you stopped by and I appreciate the kind words. Happy Holidays! Thank you Kerri! You are so sweet, thanks for stopping by each year for the tour! Merry Christmas! The house tour is just as beautiful as ever. I really love the pics you did in the snow. Those candid shots are sometimes the best ones we take. Thank you for putting so much effort into your decor and sharing your home with us. Jenn, thank you so much! I appreciate that, the snow was fun while it lasted for two days. Its already gone! Merry Christmas to you! sarah, it's all so perfect. so festive with your red and black. I love your outside shots. Happy Holidays to you and your precious family. Thank you Laura! Happy Holidays to you also! Beautiful! Really puts me in the Christmas mood! Thanks for sharing. where did you find your Christmas stocking holders? From one Michigander to another you do a bang up job!!! Love everything you do.